In 1969, Fort Smith citizen Julia Yadon “stopped the wrecking ball” on the scheduled demolition of the former W. H. H. Clayton residence at 514 North 6th Street. She and other citizens formed the charitable organization, the Fort Smith Heritage Foundation, and the process of preserving Fort Smith’s irreplaceable Victorian era began. The Clayton House received a total, technical restoration back to the height of its Victorian grandeur of 1882 when the U.S. Attorney for the federal Western District of Arkansas court doubled the antebellum home in size and added the gracious Italianate Gothic architectural detail. 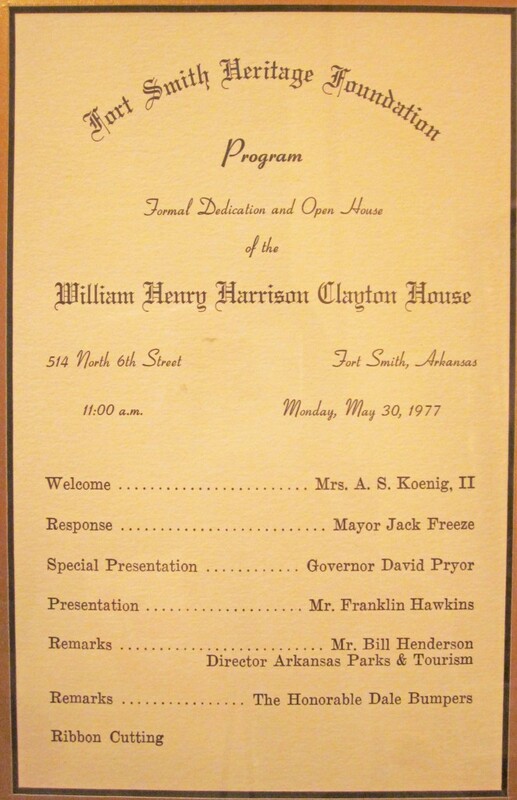 The work of taking the structure apart and putting it back together again over a 7-year period resulted in the grand opening of the historic house museum on May 30, 1977. In attendance at the Opening were Mayor Jack Freeze, Governor of Arkansas David Pryor, and U.S. Senator Dale Bumpers. The Fort Smith Heritage Foundation, under Yadon’s leadership, went on to establish a 22-block area surrounding the Clayton House as the Belle Grove Historic District, entered onto the National Register of Historic Places in 1973. The board of directors of the Fort Smith Heritage Foundation consists of 15 area citizens who work to support the programs, preservation and maintenance of the Clayton House. Mission: To protect, preserve and promote the Wm. H. H. Clayton House and the Victorian era of Fort Smith.